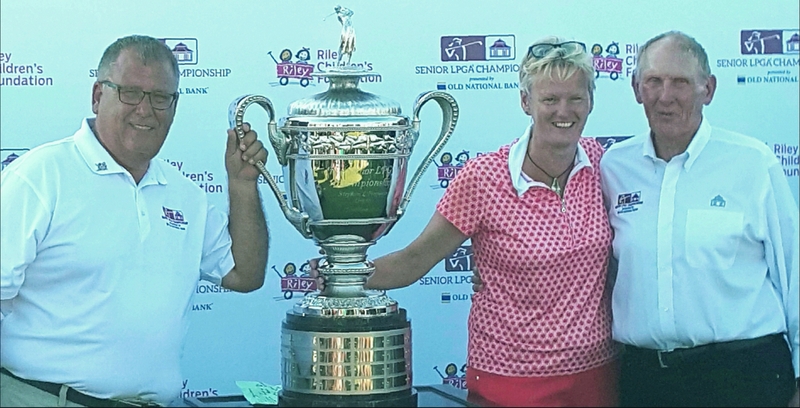 Champion Trish Johnson is flanked by Dave Harner, French Lick director of golf, and Steve Ferguson, whose visionary work led to the first Senior PGA Championship presented by Old National Bank. FRENCH LICK, Ind. 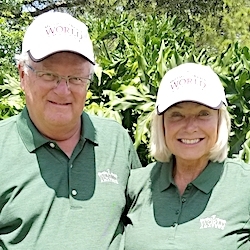 – The first Senior LPGA Championship presented by Old National Bank had a lot of things – historical significance. television coverage, beautiful weather. 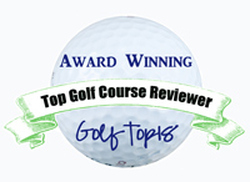 The Pete Dye Course at French Lick Resort received the world-wide attention it has long deserved. What the inaugural staging didn’t have was suspense. 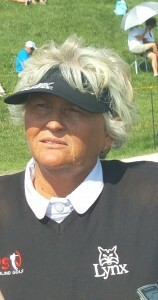 England’s Trish Johnson, winner of The Legends Championship in a six-hole playoff on the same course in 2016, was a wire-to-wire winner in this much bigger production. Johnson opened with a 67 on Monday in windy conditions, lost but one stroke of her four-shot lead after a 72 on Tuesday and nursed her way to the $90,000 first prize with a 73 in Wednesday’s finale. Her 212-total was 4-under-par on the layout that was set up at 6,117 yards for the world’s best women golfers who have passed their 45th birthday. Michele Redman, who played college golf at Indiana and is now the women’s coach at Minnesota, was the only other player under par for the 54 holes. Playing with Johnson in the last group, Redman finished 1-under for the tournament. 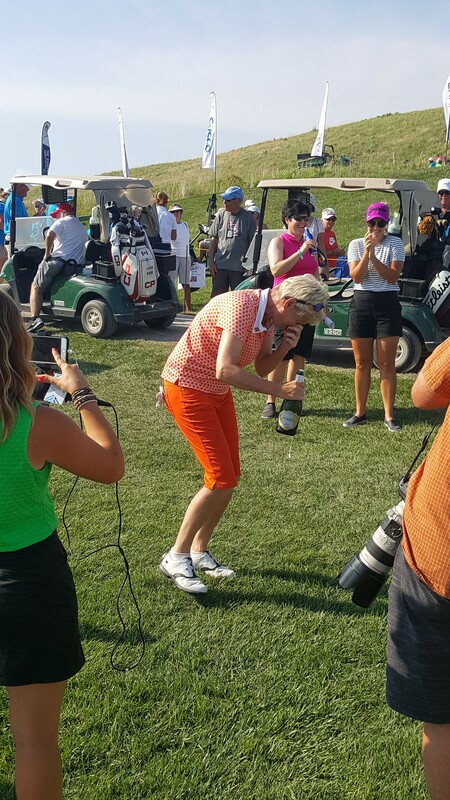 Trish Johnson had trouble with the champagne while celebrating her victory. Johnson called her second-round play “rubbish’’ on Tuesday but her course management was good enough to protect the 3-shot lead she had at the start of the day on Wednesday. The key moment in the final round came at No. 15, a 345-yard par-4. Johnson splashed her approach shot and made bogey, but Redman – down by two and running out of holes – put her drive into deep fescue. She tried to escape with a hybrid but could move the ball only a few yards. 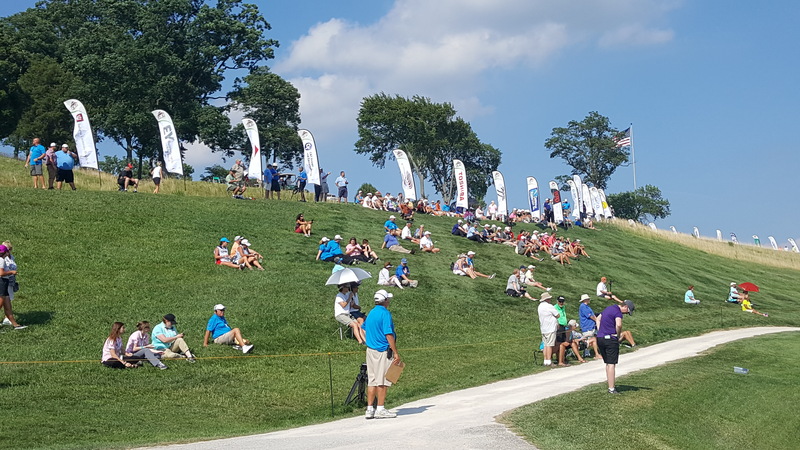 Her third was in rough beside a cart path and Redman conferred several times with rules officials before getting her third shot back to the fairway. After putting her fourth shot on the green, Redman two-putted for a double bogey and lost a shot to Johnson. Redman insisted the attempt to hit her second shot out of the fescue was the right decision, though the lie stirred some debate. “I definitely would do it again, but I would try it with my wedge,’’ she said. Johnson nursed her three-shot lead to the clubhouse where she learned that only England’s Laura Davies had made a big run up the leaderboard. Starting four groups ahead of Johnson, the long-hitting Davies was 10-strokes off the lead when play began. Her 4-under-par 68, though, was the best round of the day and Davies wound up in a tie for third with Sweden’s Helen Alfredsson and Australia’s Wendy Doolan. 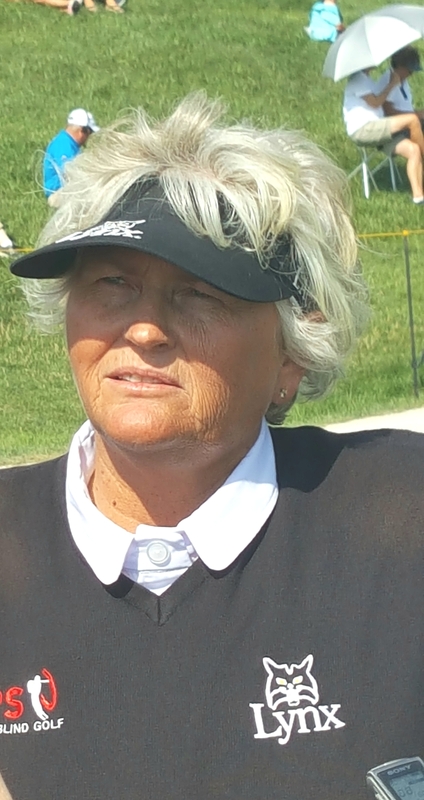 Laura Davies could only wonder what might have been after finishing with a 68. Davies started the tournament with a 7-over 79 but finished 70-68, which was seven strokes better than Johnson’s last two rounds (72-73). And Davies felt she left some shots on the course after Wednesday’s round. Johnson, 51, plays mainly on the Ladies European Tour now, and she won on that circuit for the 19th time in 2014 after carrying a 5-stroke lead into the final round of the Scottish Open. Her win at French Lick last year was more dramatic. She went six extra holes with Juli Inkster, who wasn’t in the field this week, before securing the victory. The Legends Championship, though, wasn’t considered an official major. This week’s event was. Fans on the hill beside the No. 18 green got the best view of the Senior LPGA Championship.